Congratulations on 100 games Macca! Congratulations to Kathy “Macca” McBride who played her 100th game when she ran out as captain of the Reserves against Berwick on Sunday. Although the Devils were unable to secure a win, Macca was named Best on Ground. In a signature performance she willed herself to the contest time and time again and put her “falcon” smother technique to good use. 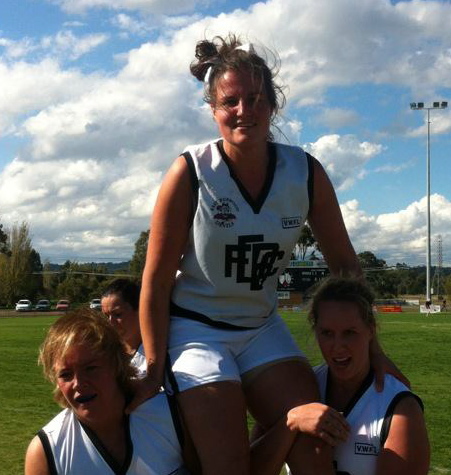 Our only premiership captain, having lead the Reserves to glory in 2008, her Best and Fairest win last year showed she is still in her prime. Check out more pictures in the Milestones gallery.